They say "Better Later Then Never". And I fully agree, discovering one by one true "jewels" of boardgame hobby. Recently I had pleasure to "taste" something really huge - namely Empire of the Sun. I will be quite honest - there are not many players in my group with whom I can try to tackle that pretty complex game. Still, there are some and Kuba - who is fascinated by War in Pacific in general - agreed to join the endeavor. 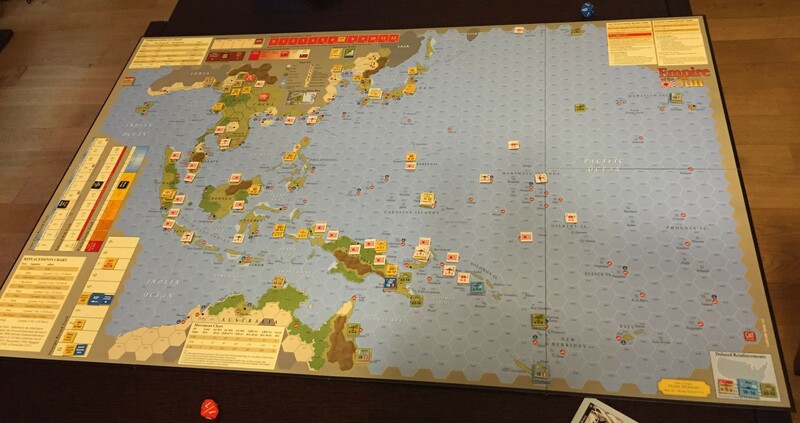 After reading the rules like twice and watching fantastic YouTube movies explaining the game mechanics, we plunged into the world of land, naval and air warfare spanning almost half Pacific and half of Asia. As players well experienced with Card Driven Games we grasped the mechanics pretty quickly - which does not mean that we had to loop-up rules from time to time. 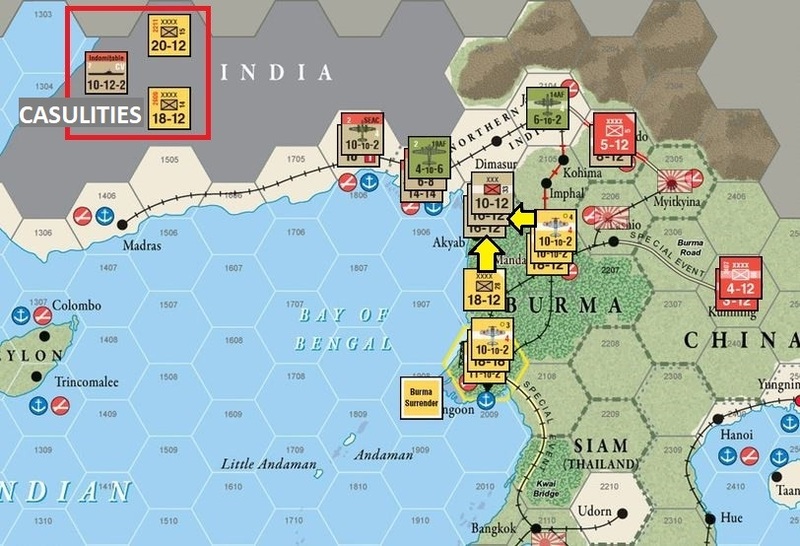 Here I would like to mention that I am finding EotS Vassal module quite useful and helpful, especially in depicting what happened during the game. So below you can see two theaters, where majority of our fights took place. However, I managed to trick Kuba there - during his large offensive, I have counter-attacked with air forces which resulted in two Japan armies being destroyed. Of course, my plains also suffered, but it was worth it - especially for the morale of poor British soldiers being constantly attacked here. However, the joyful moment quickly passed away, as Kuba managed to amass new forces and in the end destroyed the British aircraft carrier. 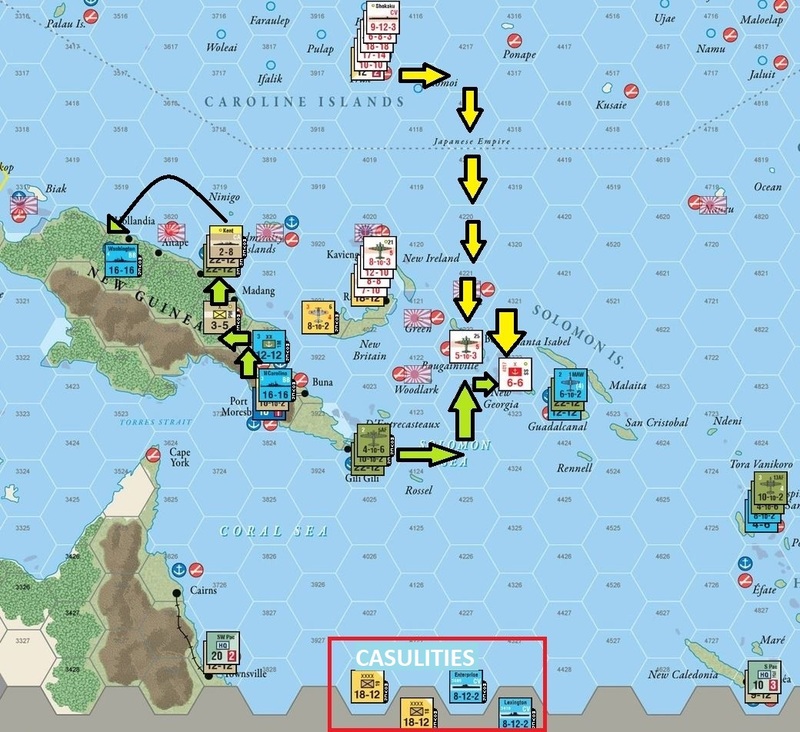 There was not much what can stop me in New Guinea and I managed to "steamroll" through the whole island, eliminating two Japan armies in the process without any causalities on Allied side. Unfortunately, two unsuccessful landings on New Georgia costed me two old aircraft carriers. Yamato and its fleet was still strong and able to inflict huge causalities during counter-attacks. Always great to see session reports! Agree vassal is a great tool for visualization. The only rules comment that comes to mind is reference the air offensive in the CBI that destroyed two Japanese armies. Air cannot eliminate the last ground step in a hex, so you may want to relook that one. Welcome to the EOTS club, it’s a great game!